One of the best things about having a blog is I get to know a lot of other women and their stories. Many of my Loyal Readers tell me they're inspired by my own stories, which really surprises me because that's how I feel for my readers' stories! Many times, I seriously don't know how to navigate this life but many of you always give me advice, offer tips and tricks, and share times when you went through what I'm going through and then tell me I'm going to be okay. It's so nice that we help each other, encourage each other, and just cheer each other on with our experiences and wisdom. Thanks, mamas! Empowering women (and men!) is why the Boss Bellas workshop series exists. I think it's wonderful that we live in a time when we women are now more encouraging of each other. Women are always pitted against each other. We compete with each other on who's prettier, sexier, has the best guy, best nails, best kids, best bags, best whatever. I used to be that way—envious, petty and mean. I admit it and I regret it. But now when I see posts on social media, it's not envy I see but a "You go, girl!" attitude. When we see other women looking amazing, we say, "You look amazing!" When we see other women making their dreams come true, we leave comments like, "You deserve this! Congrats!" When we see other women talking about feeling low, we always send virtual hugs and hearts. Of course, there are still trolls, but I see more love than hate, and I so love that women are now getting together and supporting each other! On a more personal note, I'm seriously inspired by you all. Even when I'm whining or ranting or being maarte, you always always always cheer me up. Even when you disagree with me and what I write, you ladies engage me in such a way that either we agree to disagree or I change my mind! Thanks for inspiring me, encouraging me, and empowering me. I hope I do the same for you, dearest Loyal Readers! Anyway, ang haba ng intro. I'm writing this — and this is not a sponsored post! — I'm writing this because Avon told me that August is when they celebrate empowered women everywhere. Now, I'm sure you all know Avon. Avon is a direct-selling company that attracts women because it allows women to earn from home. This has changed a lot of women's lives. Wives help their husbands earn, easing the men's burden to provide. Mothers get extra income for their families' needs. Mothers can quit their office jobs, be with their children, and still make money. Single moms can provide for their families — no men needed. A working woman is an empowered woman! And an empowered woman makes great changes in her family and in her society. 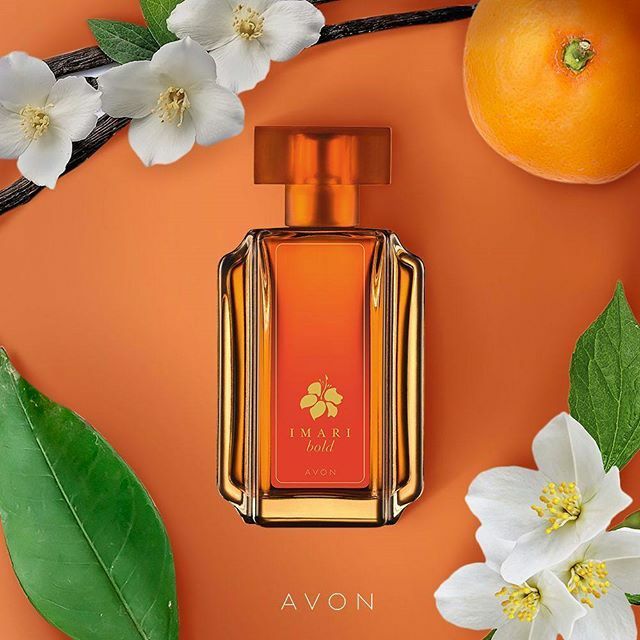 Described as a warm and sophisticated scent that evokes passion and control, Imari Bold’s captivating smell is the easiest way to add a touch of understated class to your look and stay confident all-day long. I love this! Imari is my second-ever perfume (the first one is Sweet Honesty, also an Avon scent). Imari has other variants now and I really like Imari Bold because it has a sweet fruity-floral fragrance. I bring it in my purse every day! I love that it's my favorite color, too. Looking for a bra that literally changes depending on your needs? Look no further! Avon’s Cassandra Underwire bra with removable/movable high neck lace cami lets you wear it in different ways. And the best part? It comes in a beautiful purple shade that complements just about any other item you have in your closet. It's nice, no? You can wear it two ways—one for showing off cleavage, and one for covering it up prettily. Two bras in one! 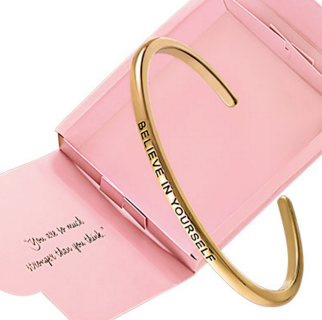 A simple but gorgeous imitation-gold half bangle with the phrase “Believe in Yourself” that aims to serve as a daily reminder to all women to always appreciate and assert your worth. Buy it! Okay, I love this. I want to make a lot in gold, silver, and rose gold and emblazon them all with empowering statements! 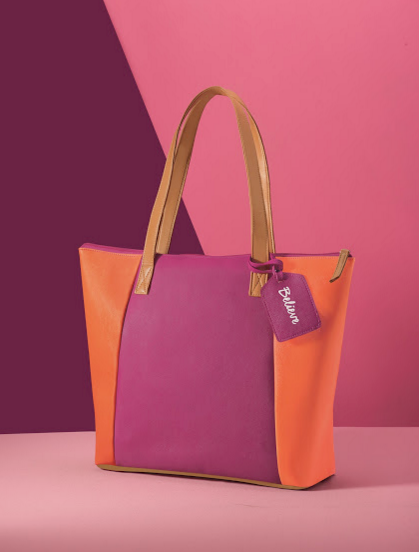 A tasteful two-tone leatherette bag that can fit all your everyday essentials without sacrificing style, it’s also perfect for adding a pop of color to your ensemble. From work to play, this bag is the perfect companion for modern women who are not afraid of stepping out of their comfort zones in the name of pursuing their passion. A tote bag in my two favorite colors! It's nice and roomy, too, and adds a pop of color to corporate uniforms or, if you work in a creative environment, it's bright and fun. If you're a mommy, this is perfect for all your mama needs. That's why I'm giving away the Briana shoulder bag to one Loyal Reader! Just post on the comments below an empowering experience as a mother. I'll publish all the comments when I announce the winner* on September 4, Monday. Hooray! Thanks, Avon, for sending me these wonderful gifts. God bless you more for empowering so many women all over the world! Don’t have an Avon Representative? Shop online at http://avonshop.ph/. Visit www.avon.ph or like Avon Philippines on Facebook to find out how you can get in touch with a Representative. Want to order Avon on-the-go? Download the Avon Brochure application from the Google Play or Apple Store to start browsing our latest brochure today! The Avon Brochure app will connect you to a nearby Representative, so you can enjoy personalized service. *winner must have a Philippine address that Xend delivers to. Winner may also pick up the prize at my home. Thank you for being an inspiration to me. Being a long-time reader of your blog showed me how a woman can positively change once she becomes a mother. Like you, I had self doubts about becoming mother at first and now that I have a 4 month old, oh, it's the best thing! I'm a newbie mother and I have a lot of ground to cover in terms of parenthood and having a positive support from personalities like yourself helps a lot. My most empowering experience has to be my breastfeeding journey. The fact that my body can produce the nutritional needs of my son gives me sense of purpose and pride like no other. During my first month as a parent, I was groggy half of the time and the other half was spent playing and replaying worst-case scenarios in my mind nakakaloka! But whenever I breastfeed, I am calm and my baby is calm. It felt (still does) like the single task I can do well as a mother. I'm struggling with my milk supply but I do the best I can so that my body can be more in tuned with my son's nutritional needs. Thank you for being an empowering force to new mothers (and bloggers) like me. Thanks for reading the whole post! =D You know, when I was a kid, I wanted to be an Avon Lady! As a Mom,first time Mom rather, I wanted to be hands on in every needs of my little on. To do it, I always do a research and interviews other Moms of their experiences and learning's as Mothers. From them I discovered a lot of techniques and ideas on how to take good care of my child properly. This empowered me and made me feel I'm a good Mom. His hugs and cuddles I love most makes me to be as stronger than before. I'm also grateful I became an Avon Franchise Dealer, this boost my confidence and really helps me a lot to fulfill all our needs financially. Being a working Mom is not a simple task but with perseverance and Faith to God, I know that I can make it. To build and achieve bigger dreams for my loved ones. Good day ladies and gentlemen, I would like to congratulate miss Topaz Horizon for the successful events and activities in such women's empowerment, opportunity, awareness against violence and diseases. Also stay beautiful, strong and God blessed. Beautiful post! :) I'm joining your giveaway because I want to share one of my empowering experiences as a full-time working mother. My most empowering moment for me is Being a first time MOM itself, giving birth, when I saw my daughter's face for the very first time. Knowing that I grew this actual person inside of my body and seeing her on the outside, living and breathing, really amaze me how amazing a woman body can carry the most precious thing in the world that bring so much joy to us. My empowering experienxe as a motger was when my sister-in-law gave birth to my nephew, she was having a hard time dealing with all the mommy duties, i understand not all of us women can actually deal with these sudden changes as a first time mom. I knew it because i also need guidance and advices from my mom and grandma when i had my 1st baby. Since my sister-in-law is living with us, im the one who guided and helped her as she learned and adjust being a mom. I explained to her every details on what she should do and not do in every possible scenario. And the worst part was when she thought she didnt deserve to be a mother because she has no idea of how to take care of a child. I never fail to remind her that everything she was feeling was normal that time and that all of us really have no idea of how to be a mother but thanks to technology now, we can google or read blogs or watch vlogs to help us,i even suggested she attends a mommy expo or ecents to help her out on things she needs to know. And now im happy that she's now enjoying her duties as a mom of my nephew. Thanks for a wonderful blog post of yours mommy, you know it is very inspiring to read such blog. It will motivates a lot of women, married or single. Being a mom and having such makukulit kids are not easy tasks for me. I am a full time mom and i have no extra income. I realized that i have to help my hubby because our family's basic needs increases since we are four in the family now. It is not that easy to find ways on how to make extra income until i decided to sell some items online including dress, tickets, makeups shoes and more. Viola! Instant income for me! I am very happy that my hardworks and efforts are paid off. Basta masikap at mtyaga ka lang, nothing is impossible. It really helped my family nd my hubby is very proud of me. You know, don't forget to pray and God will provide but of course you have to move and start what your heart desires. Soon, magbubunga din ang lahat. Hope may mainspire sa story ko. Thank you! The empowering experience as a mother that I been through is when I become a mom. At first, I never thought how it was and how to be, what to do and what next. There's so many questions in my mind that need to answered. I still have my mom but she's too far away from me to guide me to my journey in motherhood. Well, it never stop me to search those questions in my mind, and I find a way to be a good first timer mom. I join and read forums related to mom and baby. I'd search a lot of things and do it by myself. I'd talk to my close friends and colleagues (like how to take a bath your newborn baby. I got inspired and learned new things with the help of other mother. Well too cut the long story short, I survived and I did well. My son is now 4 years old healthy and smart. Big thanks to all the mother who helped me in times I need someone to talked to and advise me on what to do. Now I'm having an online business and taking care my son. The most empowering experience i had as a mother is to be able to subdivide my time to my three kids,especially when there is occassion or events that i had do attend too. I remember my eldest who is on college has a pta meeting at 8am then my 2nd has a contest that she joined and i make up to hurry and go to her event to support her and be her no. 1 fan at 12pm then later on my youngest has an event too at 6pm.parade of the national costume.. i really dont know how i make it but i do.. ps they had different school As a mom, i experienced everything from being a cook,plumber,electrician etc,name it i try to fix it on my own because my husband works overseas.i do sometimes cry because i get cut,bruise but i manage to do it for my kids.. I can call myself a supermom sometimes..hahaha.. My kids is my everything and i will do anything for them because i believe i am blessed because of them..
My life started to grow when I built my own family. As a Mom, I reminded myself how strong and brave I am to handle things in my family. I just look a positive ways to encourage myself when the worse things comes. I want them to see me a good example so if they grow and build their own family too, they have an idea how to face the reality. Right after I attended the first Boss Bellas Workshop (you were one of the speakers! 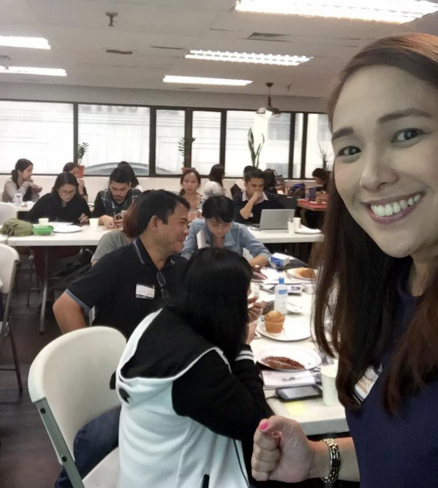 ), I felt really inspired and empowered to pass on my learnings to other mompreneur-wannabes. 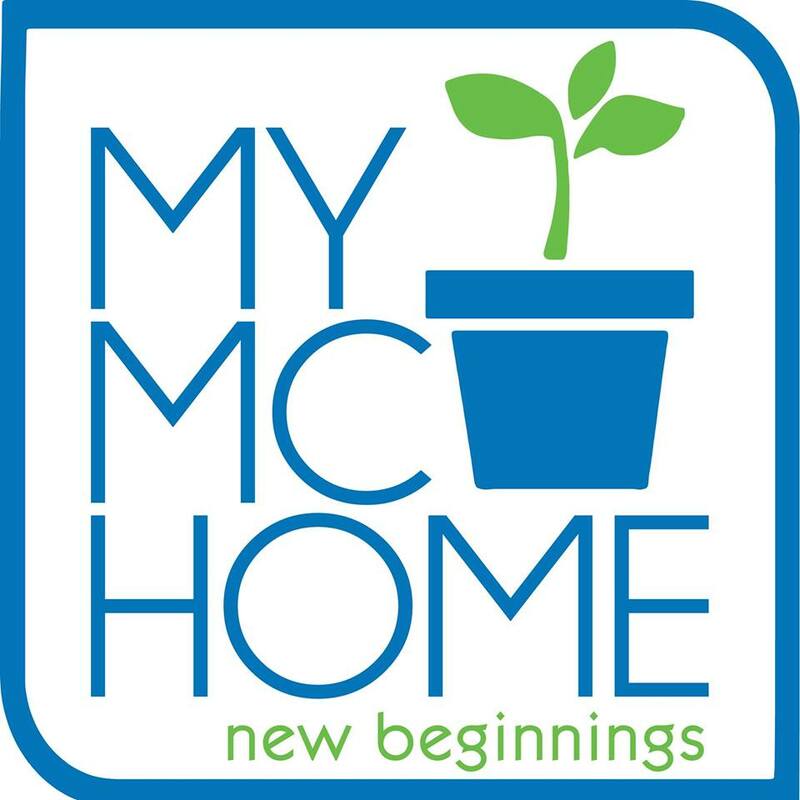 That is why last August 20, me, together with The Feast Lancaster servants, launched the HOW TO BECOME A MOMPRENEUR workshop in our local village - Lancaster New City in Cavite. 80% of mothers here have OFW husbands. We know these moms aspire for a stable source of income so that their hubbies can return home and be present-fathers to their kids. It was both a passion project + ministry to launch that workshop. I took on the role of the event director and host. I invited real mompreneurs -- one who has her own tutorial centre; another an online seller; a digital WAHM; and another a baker/ baking teacher. I love it when people see my (C-section) scar when I wear a bikini. Im truelly admired mamas who keeps thier fashion as a mother and as a avon dealer or have a business.me i was supposed to be a housekeeper in the office and i assure that even im a working mom i keep my kids happy by taking time as a bonding . Hi! I'm sheryl and I am a working wife and mom of two sweet baby boys. I work as a public attorney and though there is a common impression that female lawyers are empowered and confident due to the nature of our profession, believe me, there are days (and nights) that this is not the case. In my work, I get to meet and work with other women, many are victims of crimes and violence perpetrated by the very people they love and trust. These women come to our office often as a last resort when they feel truly hopeless and desperate. When I work with them, I end up giving more than just legal advice and help some I get from my own albeit limited experiences of love, loss and betrayal. Yet, in facing their losses and fears with them I also gain so much. While helping these women cope, I also get to encourage them to see that there is hope still and that they have a cause worth fighting for; that they are not alone. This is how I get empowered as a woman and as a mother. When I get home exhausted but with a deep sense of satisfaction that at least I made a small difference in one woman's view of her situation. When I look at my sons, I feel hopeful that I get to raise them with these values and with more compassion for others. To know that even though Mommy gets busy sometimes, the world they get to grow up in may be a better place for it. P.S. My Inay is also an Avon lady and she still uses Avon products and still loves them! When I have learned that I am pregnant, I was so happy and thankful because God gave me the most important and precious gift of all, my child, my Xandrea Cayenne. At first, there were many thoughts and good plans that came across my mind which includes what will my baby look like, what will she become when she grow up but one thing I know for sure, that I will breastfeed her because I have learned many good benefits of breastfeeding. I exclusively breastfed my daughter for six months and extended it until she was two and a half years old. To sustain it, I expressed my milk during break time in the office. It is very challenging because that includes packing my Breast Pump, milk container, breast pads, ice packs, and accessories everyday then unpacking it, labelling it before storing it in our fridge and then sterilizing my pump to be used again the following day. It is a real sacrifice because I commute and travelling to and from our house is a real challenge because most of the time I need to wait for a long line to ride an MRT, or standing in the bus and during those times I need to brave flood just to transport my milk as fast as I can to fridge it, and then breastfeed her at night and weekends. During weekday breaks when I am expressing milk, there were times that my milk was enough but there were times that I can’t express hard enough but it did not stop, I keep on pressing because my goal is to sustain my child with my milk. Breastfeeding made me feel that I am an accomplished and EMPOWERED MOM because I made the right decision to do it . Expressing thought me to be persistent because there were times that I want to give up breastfeeding because I felt tired and stressed but seeing the wondrous effect of breastfeeding to my daughter made me continue it. Hi. Thank you for sharing about women empowerment and Avon products. When my Nanay was still around, she used to be an Avon Lady. I would accompany her to buy her products in Avon's branch in Taft Avenue. Naging top seller pa nga siya. I am not a mother yet but I experienced and saw how powerful a Mom can be with my own Nanay. How I wish my husband and I would be blessed with my many children soon... I miss my Nanay everyday but I am very grateful that she was my mother and will always be. Thank you for sharing your blog to us. 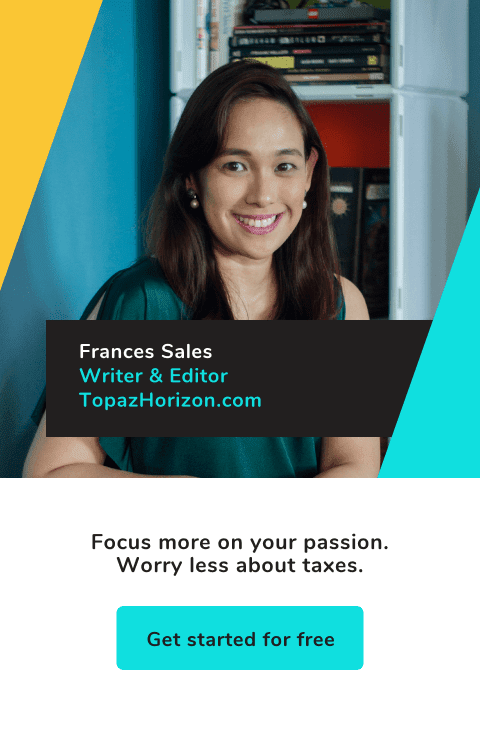 Thanks for this very inspiring message to all womens Ms. Frances. Very well said and tagos sa puso po talaga ganda. Ako, bago ako naging isa ina walang wala po talaga. Kasi pagka graduate ko pa lang eh nag asawa na agad. After the civil wedding plan po talaga namin mag asawa na huwag muna sana mag anak kasi maghanap muna ng trabaho para pagnagkataon na mag anak ako at least may trabaho na at may mapagkukuhanan na ng panggastos. But unfortunately hindi natupad yun, kasi one month after the wedding hindi na ako dinatnan. We're both happy naman kahit bigla nag out of way sa plan kasi blessings naman yun baby. Kaya napagkasunduan namin, if medyo malaki na si baby mag work na ako pero Hindi pa rin natupad yun kasi nabuntis naman ako for the second time. Kaya naisip ko na kung paano na ako makapagtrabaho at magamit ko naman yung napag aralan ko kung may two kids na ako? Mabuti nalang po at subrang bait ng naging byenan ko at nagpresenta siya na siya mag aalaga ng dalawang anak ko. Subrang nagpapasalamat po talaga ako at kahit papaanu makapagtrabaho na din ako sa wakas. Pero sad to say, kahit dalawa kami ng asawa ko ang may trabho kapos pa rin. Kaya ang dami ko na naisip na mag sideline, Isa na dun yung magpapasaya sanaas dealer ng Avon kasi dati pa naman yun noong college pa lang ako na gustong gusto ko mag dealer kaso ang hirap din pala if wala kang gaanung kakilala kaya hindi ko tinuloy yun. Kaya ang pinasok ko na sideline at yung pagbebenta ng load (retailer). Kasi sa pinapasukan ko walang nagpapaload Kaya naisip ko maganda iyon kasi walang kumpetensiya. Kaya Yun, nag click naman at hanggang ngayon tuloy pa rin ang maliit na sideline at kahit papaanu naman kumikita at may pandagdag na rin sa gastusin sa bahay. Laking tulong po talaga, Kasi kahit may trabaho ka, lalo na kung dito Lang sa Pinas paniguradong kapos talaga kaya hindi po pwede na umaasa ka Lang sa sahod kailangan mo rin gumawa ng paraan para may extra income at may pandagdag na sa gastusin sa bahay. A mother shapes the future one child at a time. This is how valuable this role is. :) I am glad to be one. Several months ago some people commented that my daughter was thin and small. Actually she had normal weight but I let the comments get to me. I got stressed every time she ate little and I tried to have her eat more. It got so bad that one time, she really cried. I felt guilty and thought that there must be a better way. I joined a seminar about eating right and read about other people’s experiences. I realized that my daughter is in charge of what she eats and how much. I am just in charge of preparing healthy meals. Now, even though I still hear those comments, I don’t let other people’s opinion of my daughter affect our relationship. She’s happy and has normal weight. I’m doing my best. I know from this experience that whatever issues I’ll encounter as a mom, I can always help myself be better. That for me, is very empowering. Thanks so much for all your stories! God bless us mamas!